Typically, athlete’s foot is the result of moist and damp conditions surrounding the feet. These conditions make the foot susceptible to fungal penetration. There are a few ways to treat fungal infections, including: prescription antiperspirants, antifungal creams / lotions, and drying agents. As athlete’s foot is more prevalent in moist and damp conditions surrounding the feet, common places where one may be at risk of the infection are swimming pools and public showers. 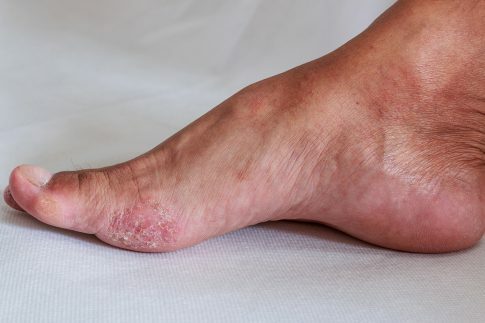 There are varying degrees of severity of athlete’s foot, from mild scaling and itching to blisters and inflammation. Athlete’s foot usually spreads from between the toes / arch of the foot all the way to the bottoms and sides of the foot. Expanding on what we had mentioned above, successful treatments for athlete’s foot involve medication and rest for the infected foot. For mild instances, over-the-counter ointments, powders, and lotions can assist with inflammation, scaling, and itching. Another method of treatment are foot soaks, which dry out any excessive perspiration. However, it is best to consult the Foot and Ankle Wellness Centre before pursuing treatment, as we will be able to properly assess the fungal infection.